Digital Signage: GreenMediaHD is a Solution Provider with the experience to bring you all the tools and platform you need to display in High Definition and Real Time: videos, images, web pages, Video Streaming Broadcasting, OTT private or public TV channels, Distance Education, and other digital informative media, in multiple screen terminals all over the world. Energy Reduction Visualization tool, and Energy Audit Only to support Corporate Sustainability Programs. 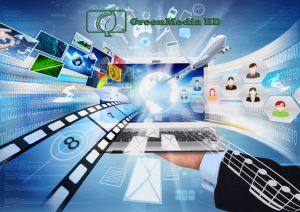 With GreenmediaHD tools, you upload all your media content to the GreenmediaHD Cloud Server and prepare all your different Playlists for all your screen terminals. These Playlist sequences will be downloaded by a GreenmediaHD TV Box decoder that is connected via HDMI cable to a TV screen display where your Playlist is shown. Therefore, with the GreenmediaHD solution, you can show your advertisements in unlimited number of screens and in a variety of screen formats to choose from. You can also show up to 6 distinct messages on the ticker of each screen. All the terminal screens are updated periodically, so all the content changes you make in the Cloud Server will be reflected in your terminals. The media content is also saved in the GreenmediaHD TV Box decoder; therefore, if the internet connection fails, the displayed information in the screen terminals is not affected. GCOP Chiller Optimizer Program: The GreenmediaHD team has more than 20 years of experience in the control and optimization of Air Conditioner Systems. We have installed our chiller plant optimizer control system in many buildings with great results in energy savings (up to 25% saving of energy consumption in the chiller plant). This experience allows us to integrate the results of these energy savings in form of trend graphics and tables, in the content of the Playlist, so you can promote by public displays or web access the energy saving results that you are achieving in your Sustainability Program. 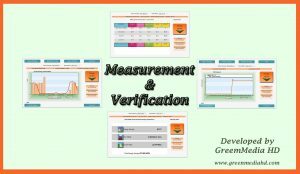 Measurement And Verification: The GreenmediaHD team also have the experience in installing power meters (or integrate power meters already installed) to measure and verify your power consumption in your company building. 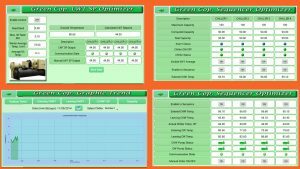 With these measurements, GreenmediaHD process the information in the Cloud Server and create content to show the information in the Digital Display Playlist in form of bar and curves trend graphics, or a WEB access from a PC or Mobile device, that compares your consumption with a base-line to, plan and alert you increase your consumption. This projection is at the same time you ROI and energy reduction/ Energy Audit calculated in real time.